Introducing the secret to perfectly fried food in the convenience of your own home. 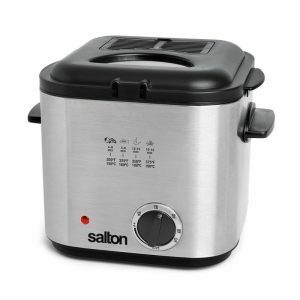 This Salton Deep Fryer will produce restaurant quality fried food without having to pay restaurant prices. With its large 3L capacity and convenient viewing widow to monitor the progress, this Deep Fryer is the perfect addition to any kitchen. The adjustable temperature control and ready light indicates the optimum cooking temperature to ensure perfect results every time. Finally, eliminate the mess by resting the wire mesh basket on the edge of the fryer to allow the oil to drain from the food. 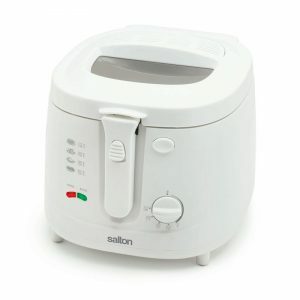 Whether you’re cooking French fries, onion rings, chicken, fish filets or donuts, the Salton Deep Fryer will have all your family and friends talking about your restaurant-quality frying skills! Wire mesh basket rests on the edge of the fryer to allow oil to drain from fried foods. Your order will take approximately 5-10 business days to arrive depending on location. On-line purchases may be returned prepaid within 21 days of receipt but must be in new and unused condition, complete with all original packaging, accessories, instruction manuals, etc. Unfortunately, shipping charges are not refundable. Only items bought on-line may be returned. Please contact our Returns Department at [email protected] for an RMA No. (Return Merchandise Authorization) You will need to provide the reason for return, model number, your name, address and phone number. You will have 30 days from issuance of RMA number to return the goods to our warehouse. Returns sent with an expired or no RMA number may be refused or delayed. After your item(s) is received in our warehouse, it will be inspected. If the item is returned in new, unopened, and unused condition with the return section of the packaging slip, you will be issued a refund at the original purchase price, plus sales tax if applicable, by the original payment method, minus original shipping charges. Please allow up to 14 business days for your refund to be processed. Please refer to the Instruction Manual that came with your product for warranty period and information. Instruction Manuals can also be found on our website. If your product becomes defective within the warranty period, please return to the retailer from whom it was purchase, If the retailer’s warranty period has expired, contact one of our Service Centers or the Salton Customer Service Department at [email protected] At the discretion of Salton, your ‘in-warranty’ product will either be repaired or, if necessary, replaced. 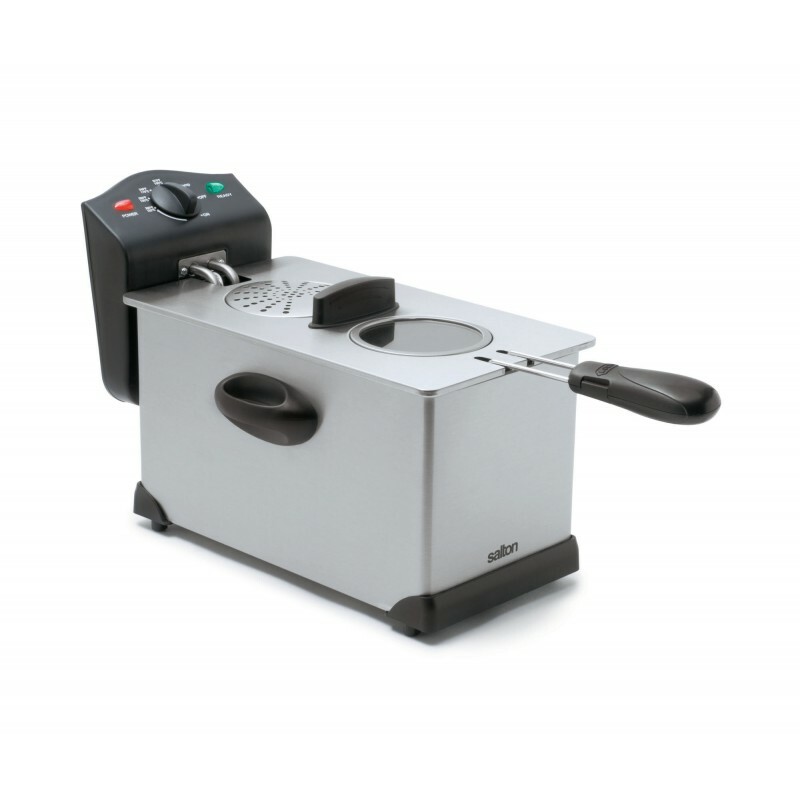 Salton Compact Deep Fryer has a smaller footprint than the other deep fryers, but doesn’t compromise on performance! This Compact Deep Fryer is the perfect size for singles and/or small families and still delivers delicious, restaurant quality fried food. The adjustable temperature control and ready light indicates the optimum cooking temperature to ensure the perfect fry every time. 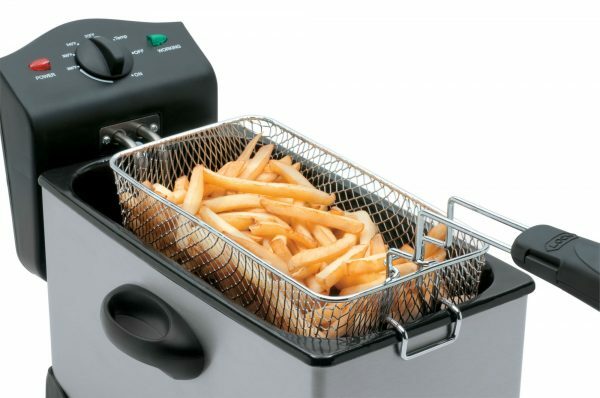 With a 1.2L capacity, stainless steel construction and cool touch handles, this sleek deep fryer can handle all your frying needs from chicken to fish, donuts, fries, onion rings and more! 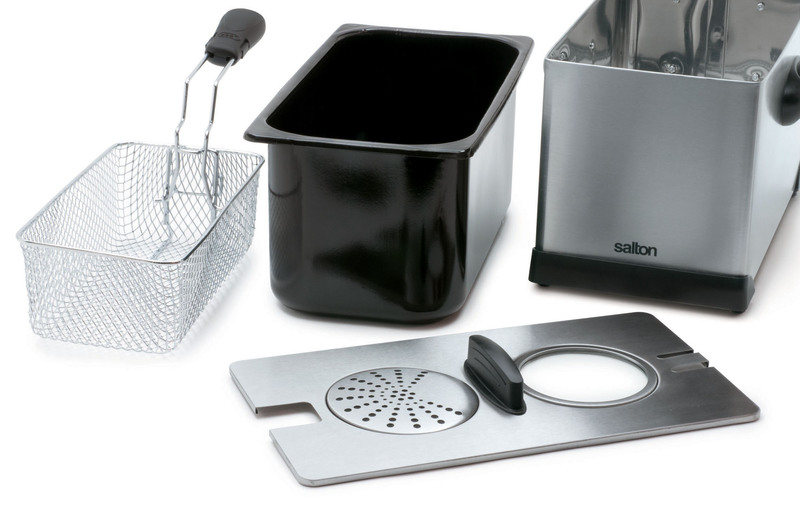 Salton’s Top Tip: Eliminate the mess by resting the wire mesh basket on the edge of the fryer to allow the oil to drain from the food. The Salton Cool Touch Deep Fryer will keep your hands cool and your countertop clean! Equipped with a basket that can be raised and lowered without opening the lid, there is no chance of oil splattering onto your counter! The basket also conveniently comes with a folding handle for compact storage, yet boasts a large 2.5L capacity for all your cooking needs. Whether you are making chicken, fish filets, donuts, onion rings or French fries, you will be able to feed everyone who comes knocking at your door with delicious, restaurant quality fried food.